Everything about iPod touch cases, accesories, news and a lot of shiny new things for the iTouch. If you're looking for iPod Touch cases, accessories, or other cool stuff for your iTouch, you are at the right place. This site is dedicated to finding every last one of them for you. Echo Mirrored Screen Protector from Proporta is a cool protector for iPod Touch. When the iPod Touch is on, the Echo Screen Protector works like a standard screen protector, keeping your iPod Touch display from scratches. But when the display back light is turned off, the Echo Screen Protector will turn your iPod Touch screen into a mirror! This would be useful for ladies -- your iPod Touch now can also be your makeup mirror. 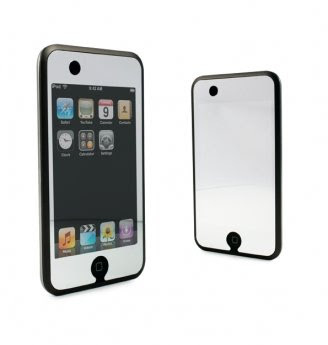 Proporta Echo Mirrored Screen protector also available for iPhone and iPod Nano. They are available on Proporta's website just for $9.95.